The Ivorians have had the comforting habit of sealing qualification for major tournaments with contemptuous ease in recent years. Yet, shaken from the invaluable experience shed by the retirements of the centurion-capped duo of Didier Drogba and Didier Zokora, they treaded the fine line of not reaching Africa’s summit this time around. If in Drogba they lost their protagonist, in ‘Maestro’ Zokora they have lost their protector; the reader of situations and the vigilant organiser in defence. The scatterbrain defending regularly shown by the Ivorian defence during qualifying is mirrored by the thrashings they were subjected to. A 4-1 defeat to Cameroon in Yaounde and a shock 4-3 defeat to DR Congo – their first competitive home loss in 9 years – in their first 4 games underlined their fragility, and though the return of Kolo Toure knitted up the defence for the final games, it is conceivable that if they meet teams with fine marksmen similar scorelines could still be replicated. With younger players being embedded in, the ceiling has been lowered for a nation that tends to have great expectations of their megastars. Indeed, the rhetoric from the management and senior players is that qualification itself was an achievement and a good run in the tournament is the target. The cast of the golden generation still remain though, with the experienced Kolo Toure set to retire after the tournament, and you would wager that, inwardly at least, the aim is for this team to finally win that elusive crown to banish the memories of the recent past, rather than merely guide the youngsters by the hand. Athletically impressive and technically capable, the Ivory Coast are excellent on the ball and should dominate possession in the majority of their matches. The scythe-tackling midfield pair of Cheick Tiote and Serey Die are undoubtedly the most combative in the tournament, but will have to work hard to safeguard an open-all-hours defence. Endowed with Gervinho’s trickery on the left, Salomon Kalou’s productivity on the right, and Yaya Toure centrally, their attacking play is intricate but there are also high crosses from the attacking full backs for the aerial prowess of either Wilfried Bony or Lacina Traore to flourish. Attacking options – Didier Drogba may have retired, but the attack remains strong in output and dynamism. With Bony, Traore, Gervinho, Salomon Kalou, Max Gradel, Junior Tallo and Seydou Doumbia, the recently crowned Russia Player of the Year, at his disposal, Renard is not short of the flexibility he craves in attack. Yaya Toure – With Didier Drogba gone, the eyes now chiefly turn to Yaya Toure to rally the troops on and off the pitch. A suspicion lingers that the four-time CAF African Footballer of the Year doesn’t replicate club form in the phosphorescent jersey of les Elephants and now, perhaps his last Afcon at his very peak, may finally be the time to silence such naysayers. Roger Assale – The only domestic-based outfield player in the squad, the TP Mazembe-bound winger was excellent in Sewe Sport’s run to the CAF Confederations Cup (Africa’s second tier continental competition) final last year. Stocky, direct and frighteningly quick, the 21-year-old can be frustratingly raw in his decision making but is an ideal impact sub. Herve Renard – A populist appointment as he has done what Ivory Coast have failed to do in the last decade or so: win the Africa Cup of Nations. A strict father-figure type, the former Zambia coach hasn’t been shy to impose his personality on the current Ivory Coast team; sanctioning curfews for poor performances, even in the aftermaths of wins. 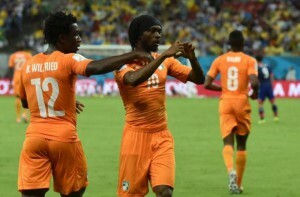 Quarter-final exit – This is a fragile Ivory Coast team which is likely to face well-drilled sides throughout the tournament. Their abysmal defence, and tendency for individual errors, makes it difficult to see them come through unscathed.